Normally, the Witte Pol (“White Pol”) is brewed in Belgium’s smallest official brewery: Inter-Pol. 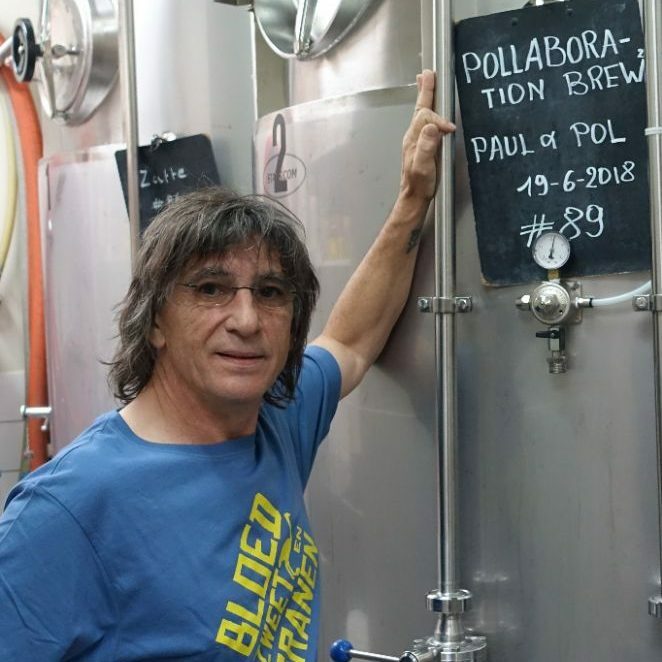 Owner Pol Ghekiere brews batches of no more than 80 litres at a time. His brewery measures about 13 square metres. It is based in an old smithy in the small village of Mont, in the Ardennes. The rest of this ancient building houses an bed & breakfast: La Vieille Forge. It is the perfect base for those who want to visit the Brasserie d’Achouffe. It’s about half an hour’s walk to brewery producing the famed dwarf beers. In La Vieille Forge, Pol and Tine cater especially for beer lovers. All five guest rooms are named after well-known Belgian breweries and furnished accordingly. In some of these rooms you can even sleep under a beer yellow bed sheet lined with foam. No wonder Pol and Tine have a lot of brewers over. Which obviously means they need a bar too. They stock a wide range of beers there and of course pour Pol’s beers there too. Unless he feels like brewing something different, the menu consists of ‘white’ Pol and a black one. Witte Pol is a wheat, Zwarte Pol a stout. Under normal circumstances Pol is able to supply his bar with enough of his own beer. This year though, marks the tenth anniversary of his brewery. “It would take me months to brew thousands of litres of beer at home”, Pol says. We decided to help a colleague out and invited him to our brewery. We would brew together, send him what he needed for a fabulous party and keep a bit of it ourselves. 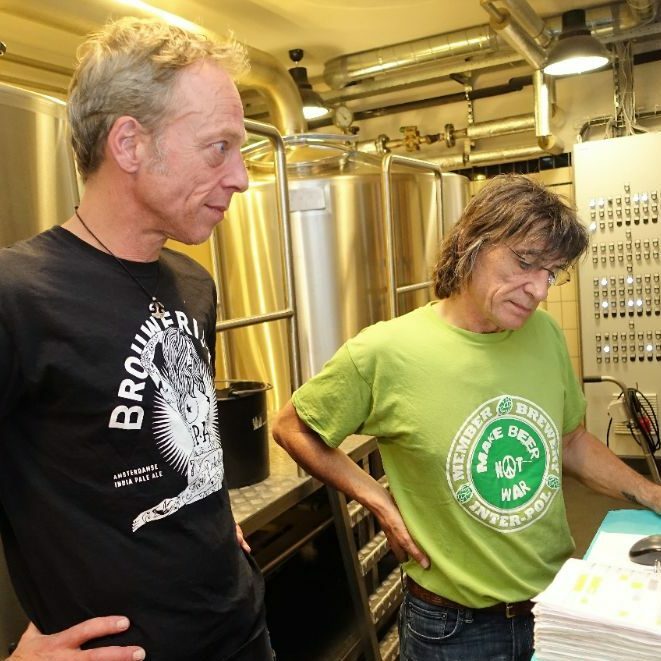 That’s how Pol ended up brewing his wheat beer in Amsterdam. We paired him to man who has, most likely brewed more wheat beer than any other Amsterdam brewer: our very own Paul. Pol and Paul, we also liked how that sounded, as a duo. The working title, Pollaboration, was an easy one. Just as its original Belgian version, this Witte Pol was built on solid quantities of wheat and some oats and rice flakes. It resulted in that full, soft flavour so typical of the classic Belgian wheats. We relied on coriander to provide that herbal touch. Pol used to work as a guide in the brewery of d’Achouffe and has been brewing in bigger breweries a couple times before so he had no trouble scaling up. “He is no home brewer”, Paul observed. As a result, he had little trouble guiding his Belgian colleague through our brewery. “No trouble, it all went smooth”, Pol reported. Paul: “We had fun. Great guy.” Part of the fun, clearly consisted of him trying our beers and we his. Our part of the batch is already finished so would have to make it down to Belgium to taste the Witte Pol again.